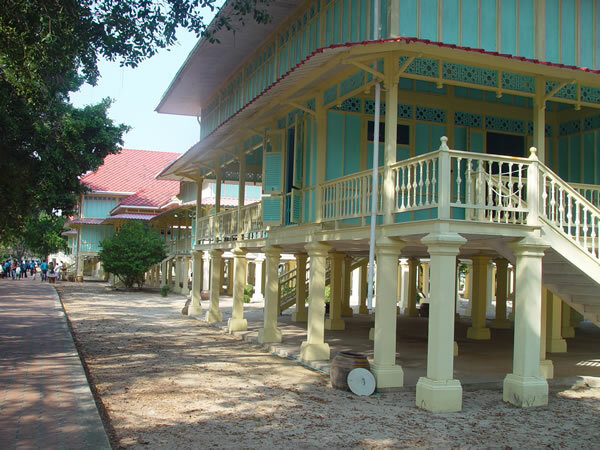 Maruekhathayawan Palace is the longest golden teak palace in the world and was built in 1924 using recycled golden teakwood from Haad Chao Samran the summer palace. The fancied latticework and verandahs was designed by an Italian architect according to King Rama VI’s wishes and was used as a summer residence in the mid 1920s. The historic site is located in the ground of King Rama VI Military Camp at the 216 kilometer marker, between Cha Am and Hua Hin. Maruekhathayawan Palace was named after the abundant wildlife-wild deer. It is also known as “the palace of love and hope”. -Samoson Sewakamat Hall- rectangular hall used for holding meetings, social functions and for two occasions-plays for his majesty. -Samut Phiman Hall- Queen Indrasaksachi’s main quarters. -Phisan Sakhon Hall- King Vajiravudh’s living quarters consisting of a bathroom, bed chamber, and study room. The palace provides a tranquil setting to stroll around. Polite attires required. Admission fee: Adult 30 Baht; child’s fee 15 Baht.